Now, It’s official! Hillary is running for president in 2016. Despite the best effort by the Clintons to hide it, events out of their control have made it near impossible to continue to conceal the plan. Bill Clinton, 42nd President of the United States, Hillary’s closest confidant and also her husband, confided during an onstage interview at the 2014 Peterson Foundation Fiscal Summit in Washington May 14, 2014 that Mrs. Clinton is running in 2016. Wait a minute! Bill didn’t say that. Right, he didn’t. Not in so many words. While one would expect Bill to defend his wife’s legacy as Secretary of State as he adamantly did during the interview but he also pressed further by addressing Karl Rove’s comments on Hillary’s health in a very specific way. Bill paused to emphasize that Hillary’s health is much better than his; there lies hidden between comments Mrs. Clinton’s unofficial announcement to run for president in 2016. Bill spilled the beans. If that sounds much like baseless assumptions, check this posting. I am not at all surprised that Mrs. Clinton is running in 2016. It’s a decision she made a long time ago, and the Republicans must be aware of that as well. They’ve been pulling all the stops to prevent that day (the announcement) from coming, for good reason. As it stands today, if her health doesn’t jeopardize her aspirations, Mrs. Clinton is running for president of the United States in 2016. 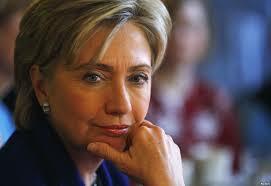 Give Mrs. Clinton one OBJECTIVE reason Not to run for President in 2016.